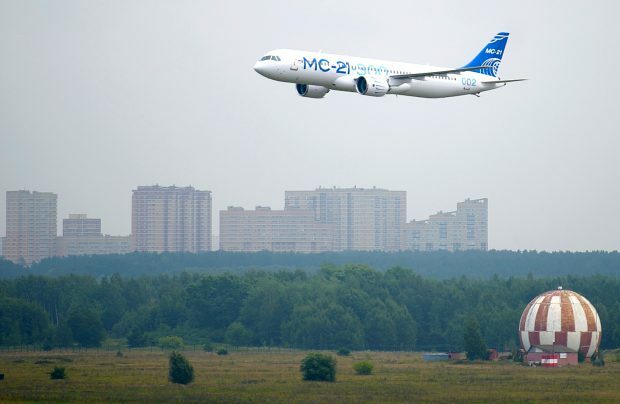 The second flying prototype of the MC-21-300, Russia’s advanced narrow-body aircraft project, has made a non-stop flight from its manufacturer’s base at Irkut to the test aerodrome of Gromov Flight Research Institute at Zhukovsky, near Moscow. The flight lasted six hours and was completed uneventfully, manufacturer Irkut (part of United Aircraft Corporation, UAC) has reported. The second flight prototype made its initial flight in mid-May of this year and has thus far accumulated some 14 hours of flight time, during which it reached an altitude of 12,000 metres and a top speed of 0.8M (TAS 850 km/h). Throughout the flights, the test team is able to confirm the aircraft’s stability and controllability under a variety of situations, including with extended and retracted gear, the checking of engine operations at different thrust settings, and the shutting down of engines in flight followed by an air start. The team is also able to calibrate the altitude and airspeed measuring equipment and check other systems. Further testing of both MC-21-300 prototypes is to be conducted at the premises of the freshly upgraded Flight Testing Facility (FTF) of Yakovlev Design Bureau, which recently acquired a new hangar and a new centre for the collection, processing and analysis of flight data. “New technologies for processing the results of the flight results ensure the high [quality] information value of each flight, as the on-board measurement system allows the recording of more than 30,000 parameters in flight,” Irkut explained. The second prototype, which has recently received a new colour scheme, has joined the first, which was ferried to Zhukovsky in October 2017 – and the third iteration is undergoing static testing at the Central Aerohydrodynamic Institute (TsAGI). All three are equipped with Pratt & Whitney PW1400G geared turbofan engines. The assembly of a further three test aircraft are currently underway at the Irkut Aviation Plant. MC-21 is the first Russian-made narrow-body commercial passenger airliner designed in the post-Soviet era. The program was launched in 2007 and is headed by Irkut, a subsidiary of Russia’s UAC.